Kata are the textbooks or even the soul of karate. It is all the more astonishing that the application of these training forms, the so-called Bunkai, is often neglected, practiced unsuitably for self-defense, or even completely ignored. The two authors have practiced karate for more than 30 years, focusing on self-defense and Kata application. They have set themselves the task of using the example of the well-known for centuries Kata Tekki (Shodan, Nidan & Sandan) to develop a method to represent the application of Kata in a generally understandable and user-friendly way. With more than 50 examples, starting with simple rambling through to attacks with weapons, you will demonstrate kata-derived self-defense forms that are suitable for emergencies. A special focus is on the pain points from the Kyusho Jitsu. Writing a book can not only be an idea put on paper, but it also needs a lot of support, understanding, inspiration and motivation from all sides. At the top of the list are of course our wives and our families, who gave us the opportunity to spend a lot of time training. In total, these are now almost over seven decades, with up to six different training sessions per week. In second place our thanks go, of course, to Achim, our coach. With infinite patience, always endeavouring to convey his immense knowledge and to advance the development of his protégés, he not only taught us martial arts throughout the years but also enriched our lives. Last but not least, our thanks go to all our friends who have accompanied, supported and motivated us throughout the years. Why another book about Bunkai? I often asked myself this question. When I started karate at the age of 15, I found Kata training rather stupid. It was too dull for me - fighting (Kumite) and self-defence (SD) was much more interesting. Shortly before the exams, things got tight - the Kata had to be learned quickly. During the test, our coach got to hear: "Your guys are doing nice techniques and are good in Kumite - but you still have to work on your Kata." At some point it was time. In 1997 I went to Ravensburg for a course to take the exam for the 1st Dan. On the course overview, I found a seminar on Bunkai; it was the first time I came across the term. I asked my trainer what it was and he replied, "This is Kata application. Come on, let's take a look." What was then demonstrated by two black belts was very sobering. Both did a partner exercise, where the attacker attacked with an announced, elementary school punch, and the defender blocked and countered precisely and neatly with the Kata techniques! "Great stuff," I thought to myself. The whole thing was reminiscent of a training form, the Kihon-Ippon Kumite, which is mostly practised by karate beginners, to develop a sense of distance and to lose the initial fear of partner exercises. This show did not motivate me to engage more intensively with Bunkai. I focussed more intensively on self-defence instead and took the 2nd and 3rd Dan in this area. In the meantime, I had to look for “advice" elsewhere, because karate had seemingly little to offer in this field. I was training Krav Maga for several years parallel to karate. It is a relatively young martial art in which only effective self-defence is in the foreground. It was a wonderful, but also a difficult time. On more than one occasion, I would come home completely exhausted and wake up in the morning covered in bruises, having problems even to get out of bed. However, what I had learned and felt about my own body was that many fundamental self-defence movements could also be found in the Kata. This realisation confirmed my first feeling what the origin of martial art, in other words, self-defence is. Perhaps with age comes maturity after all, at some point I took a closer look at the Kata, enjoyed it and filed for three more Dan exams on the subject of Bunkai and Kyusho Jitsu. Especially at the beginning, I found it particularly hard to find an introduction to the topic and looked for suggestions in karate books dealing with the subject Bunkai. The books available on the market show either very few and then mostly unrealistic applications, analogous to the two black belts mentioned at the beginning, or deal more with the Bunkai theme from a philosophical standpoint. What I was missing, was a method, a particular approach and a few practical tips. For the 5th Dan Karate exam, I decided to present the three Kata Tekki Shodan, Nidan and Sandan as a contiguous Kata and deduce a realistic and workable Bunkai from it. As we developed the applications, we always focused on the Kata, and especially the order of the techniques, and searched for appropriate attacks. We realised that by applying this "classic" approach, we came to a standstill again and again leading us to the point of utter frustration. My training partner and I came up with the idea not to put the Kata in the forefront, but the attack. Furthermore, we interpreted the Kata as a training method and its techniques as a repertoire, from which freely chosen and can be combined arbitrarily. With this approach, which we later called Direct Bunkai, we were able to develop many practical applications in a short time. We introduced this concept to others and received a lot of positive feedback that encouraged us to write this book. The development of the applications, the questions about the "why?" and the "how? ", the creation and structuring of the texts, but most of all the lively exchange with like-minded people, have brought us forward on our journey to karate (Do). We hope you enjoy reading and hope that we make the introduction to the exciting topic of "Bunkai" easier for you. Dirk Passmann (left) was born in 1969 in Oberhausen. He has been practising karate since he was 15 and has been working intensively for many years on self-defence, Bunkai and Kyusho Jitsu. The graduate engineer works as a project manager and also enjoys horseback riding and archery in addition to karate. Both authors passionately engage in karate and train with Achim Keller (centre) in the Budokan Essen e.V. club. They recognised that Bunkai, Self-defence and Kyusho Jitsu, usually treated separately, are equal aspects of traditional martial arts. They have set themselves the task, using the example of the Tekki Kata, to combine these points in an analytical method to help others to enter the world of martial arts. In creating this book, we would often use terms that in our view were in no need of further explanation. But then we asked ourselves, whether a layperson or a reader with a non-karate background, could understand them as well. We have therefore explained relevant terms in advance, to avoid misunderstandings. The term "Old Masters" is often used in karate lessons or courses. In the actual sense, the term does not refer to a particular person. It is more of a synonym for martial artists of the past, to whom excellent knowledge and wisdom are assumed. Blocking is a defence against an attack. In Kyusho Jitsu it is often quoted that there are no blocks! It is always pointed out that already at the beginning of the dispute the attacking technique is, e.g. in a swinging blow, to hit a vital point. We would like to distance ourselves from this point of view. In an emergency situation, the first thing to do is protect oneself from the consequences of a surprise attack. Whether a pain point can already be targeted in this situation depends on many factors. Ultimately, a block is a contact between the attacker and the defender. Regardless of martial arts style, this contact can of course also hit the attacker's vital points. But it can also lead to pain or injury to the attacker, e.g. because the block was executed very powerfully. The use of "vital points" is also present in other martial arts and is currently used in self-defence (SD), e.g. Jiu-Jitsu. Often the user does not know the theory behind its effectiveness. At this point, one could philosophise for a long time about what was there first; the theoretical knowledge of the "vital point" and its use, or the practical experience that some parts of the body are particularly sensitive to pain. A typical chicken and egg principle! Under the term Bunkai one understands first the breaking up of the Kata into individual sequences. These are then interpreted more deeply concerning their practical application. The character of the Kata needs to be taken into consideration. 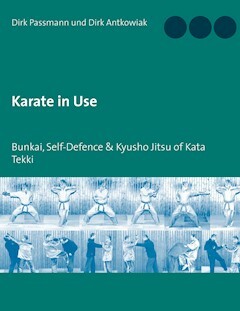 The term direct and indirect Bunkai has been developed in the course of this book's development, starting from the problem of finding a suitable attack on a technique in the Kata. Direct Bunkai puts the attack in the foreground. First, a form of attack is chosen, e.g. hitting, choking, etc., and then a solution or defence for the problem is worked out. Finally, one needs to observe where in the respective Kata the defence is to be found as a motion sequence. Indirect Bunkai puts the techniques of Kata in the forefront. First, a sequence in the Kata is chosen, and then a suitable attack is decided. A Dojo is the actual training location; there are no particular conditions attached to it. It could be a sports hall, a nicely decorated room, a garage or it could be the grounds in a park. What makes a Dojo is the respect, the responsible behaviour and the keeping of the rules among the participants. Embuses are the step diagrams of Kata in karate. In principle, it is a bird's-eye view that shows the course of the Kata regarding your directions of movement and direction of changes. Master Funakoshi was born in Okinawa in 1868 and died in 1957. Thanks to his intense work - his life's work - karate has been made accessible to the whole world. He was considered to be very humble and respectful of people. Karate was for him, not a pure sport or martial art, which was operated only in the Dojo, but an attitude that affects all aspects of life.